Richard K. Weil, St. Louis. Galerie Beyeler, Basel (acquired from the above in 1985). Acquired from the above by the present owner in 1986. D. Sylvester, Looking at Giacometti, New York, 1994 (another cast illustrated). B. Lamarche-Vadel, Alberto Giacometti, Paris, 1984, p. 152, no. 222 (another cast illustrated in color, p. 153). Y. Bonnefoy, Alberto Giacometti, A Biography of His Work, Paris, 1991, p. 384, no. 358 (another cast illustrated). 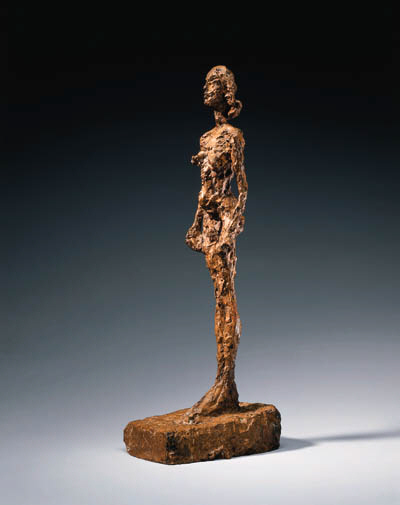 R. Hohl, Alberto Giacometti, Stuttgart, 1971 (another cast illustrated). J. Dupin, Alberto Giacometti, Paris, 1962, p. 267 (another cast illustrated; another cast illustrated in color on the cover). New York, The Solomon R. Guggenheim Museum, Alberto Giacometti, 1974, no. 73 (illustrated, p. 101). Basel, Galerie Beyeler, From Private Collections, February-April 1986, no. 19 (illustrated in color). Milan, Palazzo Reale, Alberto Giacometti, Sculture, Dipinti, Disegni, January-April 1995, p. 198, no. 54 (illustrated).